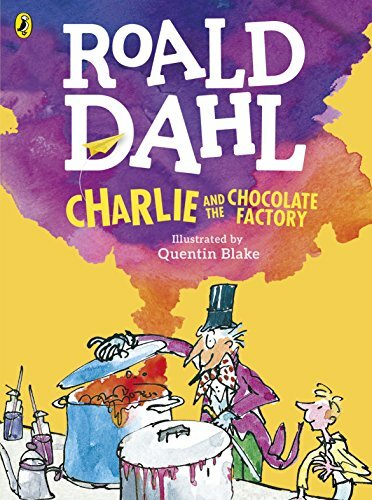 This full-color 40th anniversary edition of Roald Dahl’s most popular novel features vibrant spot art by Quentin Blake on candy-colored pages enhanced by candy-filled borders. A scrumptious read-aloud edition of a classic! Young Charlie Bucket can’t believe his luck when he finds the very last of Mr. Willy Wonka’s Golden Tickets inside his chocolate bar. He wins the trip of a lifetime, a magical tour around Mr. Wonka’s mysterious chocolate factory. Once inside, Charlie and the other four winners—Augustus Gloop, Veruca Salt, Violet Beauregarde, and Mike Teavee—witness amazing wonders: rainbow drops, lickable wallpaper, and even a chocolate waterfall. But what happens when the children, one by one, disobey Mr. Wonka? Roald Dahl passed away in 1990, but his popularity and that of his books—Charlie and the Great Glass Elevator, James and the Giant Peach, and Danny the Champion of the World, to name just a few—continues to grow. Quentin Blake, the first-ever Children’s Laureate of the United Kingdom, has illustrated nearly 300 books, including most of Roald Dahl’s children’s books. He lives in London.